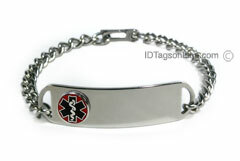 D- Style Medical ID Bracelet with raised medical emblem. Personalized and Customized ID Bracelet with wide chain. If you are not sure about right length, please refer to suggested document: "How to choose appropriate length of the Medical ID Bracelet".